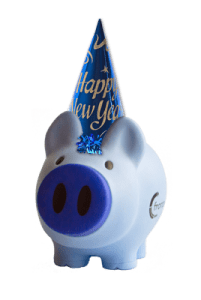 Happy New Year from Frank D. Pigg! Attainable – assure that an end can be achieved. Not sure where to start? This pig’s got you covered! You can start by taking a look at your fundraising plan for 2016. First, determine your overall fundraising goal. Next, set specific goals for each fundraising event or campaign. I know you want to raise “as much as possible”, but you’ll see more success if you set a specific goal. It’s good to keep your hooves (I mean, feet!) on the ground when you do. Be optimistic but realistic! Once you’ve got a handle on your goals you can come up with a plan to reach them. An important step is to think about new fundraising strategies you can try this year. Ex) Run an online auction! Have you heard of our new BiddingForGood online auction software? Give S.M.A.R.T. goal setting a shot this year and you’re bound to find success! Well, that’s a wrap for this month’s tips, I’ll be back next month with more fundraising poinkers (I mean, pointers!) for you.